After days of speculation on what Tesla’s mystery announcement was going to reveal, it was finally brought to light in a blog post today confirming what many suspected, “AP 2.0”. Although Tesla is not calling it Autopilot anymore as this is the ultimate hardware that will bring level 4 and 5 autonomy (aka a fully self-driving car). The hardware will come standard in all production cars as of earlier this week. This allows for anyone to activate the feature even after they don’t initially decide to purchase it with their vehicle at time of purchase. The software upgrade comes with two options (not including a third for the first generation AP). The first option is called Enhanced Autopilot and comes at a price of $5,000. Enhanced Autopilot makes use of four cameras instead of one, and also comes with an upgraded 12 sonar sensors providing a 360 degree view with twice the range of the previous sensors. The forward-facing radar with advanced processing (the radar can bounce underneath the front car to see cars ahead in the road among other things) will still be in use. All this allows for a more robust AP with much better accuracy. One improvement for example is that fast approaching cars in adjacent lanes can now be detected, whereas before, if a car in an adjacent lane was driving at a speed much higher than the speed limit than the short ranged sonar sensors in the previous version would not be able to detect it in time and if the vehicle was switching lanes than a collision would most likely occur. In addition Enhanced Autopilot will “match speed to traffic conditions, keep within a lane, automatically change lanes without requiring driver input, transition from one freeway to another, exit the freeway when your destination is near, self-park when near a parking spot and be summoned to and from your garage.” To put it simply, Enhanced Autopilot provides level 3 autonomy. 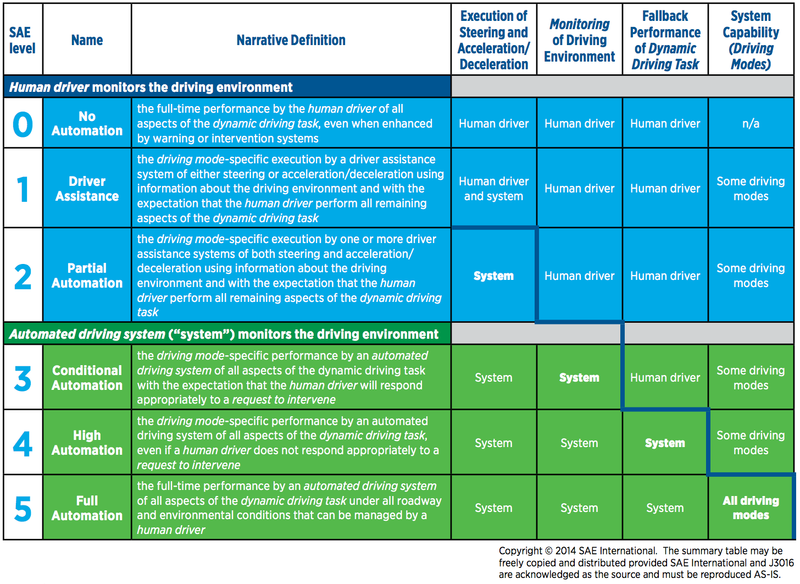 If you’re not familiar with the different levels of automation as desinated by SAE, here is a good chart from SAE International that provides a good explanation. Subject to regulatory approval Enhanced Autopilot is expected to be released this December. The second option is Full Self-Driving Capability. This option is pretty self explanatory and provides for level 4 and eventually level 5 automation. The price for this option is $3,000 dollars on top of the $5,000 Enhanced Autopilot option for a grand total of $8,000. This option will make use of all 8 cameras for a complete 360 degree view. As described by Tesla, “All you need to do is get in and tell your car where to go. If you don’t say anything the car will look at your calendar and take you there as the assumed destination or just home if nothing is on the calendar. Your Tesla will figure out the optimal route, navigate urban streets (even without lane markings), manage complex intersections with traffic lights, stop signs, and roundabouts, and handle densely packed freeways with cars moving at high speed. When you arrive at your destination, simply step out at the entrance and your car will enter park seek mode, automatically search for a spot and park itself. A tap on your phone summons it back to you.” The processing power required for this level of tech is made possible by a brand new Nvidia Titan GPU processor capable of 12 trillion operations per second making it 40x faster than the previous processor. Of course the software required for this level of automation is not yet fully developed and it’s expected to improve over time. Besides that, the regulatory approval required for level 4/5 automation varies from jurisdiction to jurisdiction and as to how many years it will take for regulatory approval is anyone’s guess. Elon Musk is hopeful that it will be fully operational by the end of next year when the Model 3 goes into production. Tesla basically has to prove that computers are much safer than human drivers for regulators to warm up to the idea of self-driving cars and thus far has collected over 230 million miles of driven data to show that. The CEO in a press release today announced that the data collected thus far shows a minimum 2x decrease in the probability of an accident occurring and this is only going to get better with the updated hardware. The idea is to show an order of magnitude safer driving with a computer than a human in order to make the case to regulators unequivocally. For those that have turned towards the media coverage of the fatal Tesla accident of Joshua Brown (the ONLY fatal accident that has been reported while on AP mode) will think that self driving cars are nothing but death machines. Elon Musk’s frustration over the media coverage of self driving cars was shown yet again in a conference call with journalists today when he said that the people in the media who are writing these biased articles are essentially “killing people”. “One thing I should mention here that frankly has been quite disturbing to me is the degree of media coverage of Autopilot crashes – which are basically almost none – relative to the scarcity of media coverage of the 1.2 million people that die every year manual crashes. Disclaimer: I am a Tesla employee and shareholder. The views and opinions expressed in this article are those of mine and do not necessarily reflect the official policy or position of Tesla.